DTC is a distributed facility where the NWP community can test and evaluate new models and techniques for use in research and operations. The responsibilities for the operation of the DTC are described in the DTC Charter. The DTC management plan is based on a hierarchical structure of boards and committees whose members represent the interests of the NWP community. 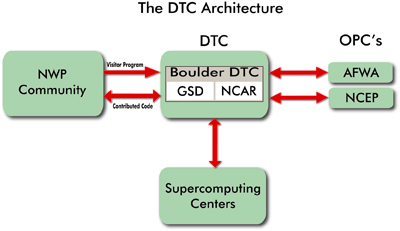 The DTC EC, which is composed of representatives from both the research and operational units of the modeling community, provides executive oversight for the DTC. The DTC Management Board assists the DTC Director in preparing the AOP, annual budget, the selection of codes for testing, and proposals for multi-year code testing and evaluation projects. The DTC Science Advisory Board assists the DTC Director in shaping the strategic direction and objectives for the DTC. MET is designed to be a highly-configurable, state-of-the-art suite of verification tools. Read more.